If you live out in the less densely inhabited regions of America, chances are very good that high-speed internet in your area is pretty hard—if not impossible—to come by. 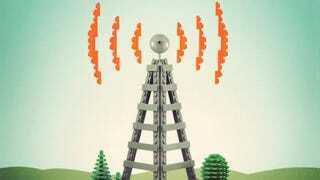 That could soon change thanks to a team from Rice University who have hacked currently unused, Ultra High Frequency (UHF) TV spectrum into a high-speed, wireless internet pipeline. "The holy grail of wireless communications is to go both fast and far," lead researcher Edward Knightly, professor and chair of Rice's Department of Electrical and Computer Engineering, told an assembly of researchers at the Association for Computing Machinery's MobiCom 2014 conference in Maui, Hawaii. "Usually, you can have one or the other but not both. Wireless local area networks today can serve data very fast, but one brick wall and they're done. UHF can travel far, but it hasn't had the high capacity of WiFi. This provides the best of both worlds." The scheme would utilize the newly-freed UHF band's broad and solid coverage range combined with a "multiple-input, multiple-output" (MIMO) array of antennas to create a wireless pipe that offers both benefits. Rural users would simply need a suitable antenna and modem to access it. "Based on over-the-air experiments in a range of indoor and outdoor operating environments, we found that UHF-band multiuser MIMO compared favorably and produced high spectral efficiency as well as low-overhead wireless access," Knightly said.